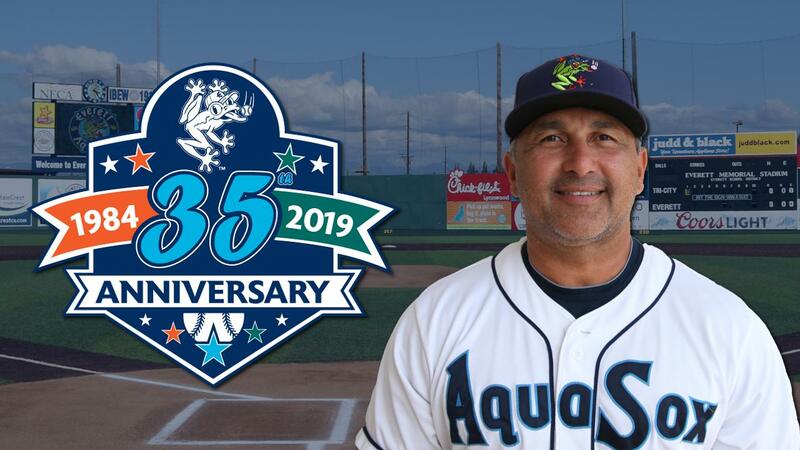 Everett, WA - The Everett AquaSox are proud to announce their coaching staff for the 2019 Northwest League season. José Moreno returns for his fifth season as manager; Ari Ronick joins the staff as the pitching coach; Joe Thurston as the hitting coach; athletic trainer is Amanda Lee and performance specialist is Alexander Pons. "We are excited to have José return to Everett this year," said Everett AquaSox General Manager Danny Tetzlaff. "he is a great leader and a winner as he guided us to our last NWL title in 2010." In his four previous seasons at the helm in Everett (2008, 2010, 2017-18) José Moreno piloted the club to a regular season record of 155-149 and a Northwest League Championship in 2010. His 2010 AquaSox club finished with 49 regular season wins, which was the most in franchise history. Last season José led the AquaSox to the best record in the first half of the North division. Moreno is beginning his 19th season in the Mariners organization and is currently serving as the manager of Cardenales de Lara in the Venezuelan Professional Baseball League (Venezuelan Winter League). Joe Thurston joins the staff this season as AquaSox hitting coach after spending 2018 in the same role with A-Modesto. Thurston, a native of Vallejo, CA got his start in professional baseball after being selected by the Los Angeles Dodgers in the fourth round of the 1999 draft. Later that year, in his first pro season he saw action with the Northwest League's Yakima Bears. Thurston, who served a utility role throughout his career, made his major league debut with the Dodgers in 2002 and spent parts of seven major league seasons with Philadelphia, Boston, St. Louis and the then Florida Marlins. Ari Ronick is beginning his first year in the Mariners organization as pitching coach for the AquaSox. After pitching collegiately at the University of Portland for four seasons, Ronick was drafted in the 12th round by the San Francisco Giants in 2008 and spent a full Northwest League season with the Salem-Keizer Volcanoes. His five-season minor-league career included a stop at AA-Richmond in 2012. Amanda Lee will serve as the club's first-year head athletic trainer. Lee, is an alumnus of the University of Tulsa and spent 2018 as a certified athletic trainer with the Los Angeles Dodgers, based at their complex in Glendale, AZ. She will be the first female member of the field staff in franchise history. Performance coach Alexander Pons joins Everett after serving in the same role at the Mariners complex in the Dominican Republic last year. He has been with the Seattle organization since 2015. The Everett AquaSox season will start on the road against the Tri-City Dust Devils on Friday, June 14 with their first home game taking place against Salem-Keizer Volcanoes on Friday, June 21. Fans can place deposits for 2019 full season tickets, suite rentals, picnics or group outings by calling (425) 258-3673 or visiting the AquaSox Front Office at 3802 Broadway in Everett.